The Activate Sensor Behavior (beActivateSensor) enables a sensor on an Entity for as long as the behavior is active. To use an Activate Sensor Behavior a Perception Locator must be mapped to the Crowd Field (directly or through the Crowd Manager Node). Sensors don't have any visible effect on the Crowd simulation. They output the detected objects and their distance. This sensor data can then be used in Channel Operators through the Sensor Input Channel Operator. An Activate Sensor Behavior defines the following specific attributes. For common attributes see Behavior Common Attributes. Sensor The Sensor Locator to activate. 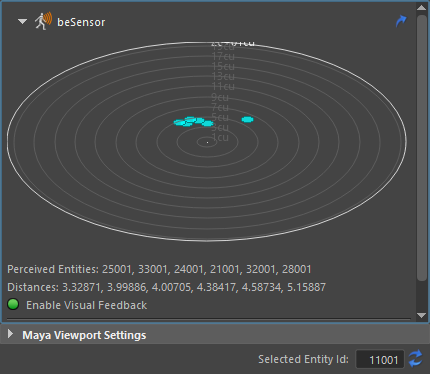 The Activate Sensor behavior Visual Feedback displays a radar view of the perceived entities or obstacles, as well as two lists, one with their ids, called Perceived Entities/Obstacles, and another one with their distances to the selected entity, called Distances.